During the workshop, attendees learned some of the concepts behind ENERGY STAR Portfolio Manager’s Multi-Family tool, as well as the data necessary to achieve a 1 to 100 score within the tool. Participants were given a sample building with general building characteristics and asked to determine a few data points necessary to receive an ENERGY STAR score. Each person left with a new understanding of how to use the tool and the collection process necessary to obtain the data. 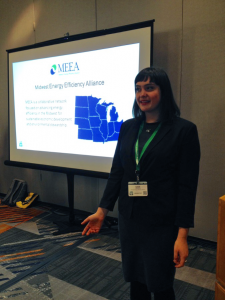 MEEA Program Associate Sage Gerson also presented on three panels at the conference on a range of topics, including the on-bill financing, the Building Operator Certification (BOC) program, and the EPA’s Clean Power Plan. Her first panel focused on funding multifamily energy efficiency, and included presentations by Matt Golden from Efficiency.org and Cycle7’s Sean Patrick Neill. Sage’s presentation highlighted the growing successes of multifamily energy efficiency on-bill financing in the Midwest. Sage then presented about the professional development and energy efficiency benefits of the Building Operator Certification program, which MEEA manages in 10 Midwestern states. This presentation was part of a larger panel about opportunities for multifamily building operators, and Sage presented alongside Andrew Brooks and Nick Young from the Association for Energy Affordability and Heather Larson from StopWaste.org, a public agency focusing on waste reduction from Oakland, CA. One of the audience members was BOC LV I and LV II certified and offered an impromptu testimonial about the program after Sage concluded presenting. Interested in the panel? Sage will be hosting a MEEA programs webinar about the benefits of multifamily operator trainings on November 23, 2015 at 12:00 PM CST. Contact her at sgerson@mwalliance.org for more information. Sage’s third presentation, along with ACEEE’s Lauren Ross, Jackson Morris from the Natural Resources Defense Council, NASEO’s Sandy Fazeli and Southface’s Alex Trachtenberg about the EPA’s Clean Power Plan, drew the largest crowd and featured a robust question and answer session at the end of the presentations. The conference was a huge success, there were approximately 400 attendees from across the nation, and many opportunities for stakeholders to network and exchange best practices. For more information visit: http://aea.us.org/. Stay tuned, the Association for Energy Affordability will be posting recordings, photos and blog posts about the conference over the next few weeks.